Is there any paperwork or document for the mechanical systems of 54 Nicklaus Dr, Bancroft, Ontario? I need more information about the property at 54 Nicklaus Dr, Bancroft, Ontario. How ist the neighborhood, location and nearby amenities for 54 Nicklaus Dr, Bancroft, Ontario? I have questions about the roof, foundation, insulations and mechanical issues of 54 Nicklaus Dr, Bancroft, Ontario? I need more information about property details. What's wrong with this house? Is this a short sale? Is there any maintenance for 54 Nicklaus Dr, Bancroft, Ontario? What is this property worth in today's market? What are "closing costs", and how much? What steps should I take when looking for a home loan? What price home can I afford? Is my credit good enough to buy this house? What are the best mortgage options for me? How flexible is the seller on the asking price? How low can I consider offering for 54 Nicklaus Dr, Bancroft, Ontario? This Custom Executive Open Concept Bungalow Less Than 1 Yr Old. 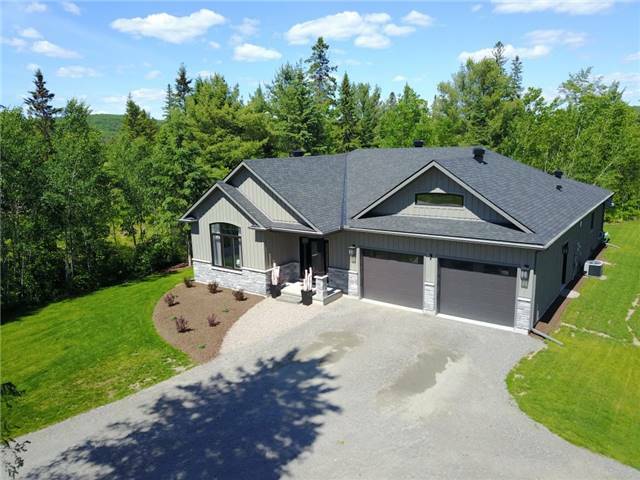 Located On The 11th Hole Of Bancrofts Prestigious Bancroft Rivers Edge Golf Course (No Condo Fees). 2294 Sqft Home Features Soaring 9 Foyer Ceiling, Italian Porcelain Tiles & Maple Hand-Scraped/Distressed Flooring Throughout. Granite Counters In Kitchen Along With High End Thermador Appliances & Blanco Ss & Built-In Coffee Machine. Quartz Counters In Baths & Laundry, Wall Mounted Gas Fp.